The Passionist Carroll Stuhlmueller characterizes the Gospel of Luke, based on its vocabulary and literary style, as “the ‘Gospel of Messianic Joy’” in his chapter on Luke in the Jerome Biblical Commentary. Stuhlmueller’s description of Luke’s Gospel is fitting, and we might understand why particularly in today’s reading, the story of the Visitation. Mary’s example of discipleship to us is to ponder the joy of our journey with Christ. Sometimes, even amid that joy, Mary ponders that which troubles her. So must we ponder and discern the will of God that brings us tremendous joy but can also be troubling to us. Why, we ask, should God have come to us at all? Jesus was not obligated to take our human form, but He did so out of love for us. He came to dwell in the womb of a human mother, to be born, to live and to minister among us, and to die and to rise to complete the long-anticipated act of salvation. We are now given the gift of the Holy Spirit, so that God’s mystery becomes our vocation. We carry the Spirit of the Lord within us as Mary once carried Jesus within her. When that Spirit is disseminated among us, when we act in the name of the Lord whom we receive in the Eucharist, we make the Visitation a perpetual and actual reality. Let us then live the Visitation by recognizing Christ in those around us, and in our prayer and acts of charity may we ponder the reality of Christ among us and within us, and may we be to this world a people of great joy. Carroll Stuhlmueller, “The Gospel According to Luke,” in The Jerome Biblical Commentary, edited by Raymond E. Brown, Joseph A. Fitzmyer, and Roland E. Murphy (Englewood Cliffs, NJ: Prentice-Hall, 1968), 2:117. Matthew 5:12. The Gospel of John uses cognates of αγαλλιάσει twice, in 5:35 and 8:56. This word and its derivatives appear eleven times in the New Testament. Outside the Gospels, it appears twice in the Acts of the Apostles (2:26 and 16:34), three times in the first letter of Peter (1:6, 1:8, and 4:13), and once in Revelation (19:7). See Heartlight’s Search God’s Word, “The New Testament Greek Lexicon.” http://www.searchgodsword.org/ lex/grk/view.cgi?number=21. Accessed 29 May, 2010. Luke 2:19. See also Luke 1:29. Fatigue, particularly under physical exertion, may result from a rapid transition to higher elevations. By May of 2008, I had been living in Cali, Colombia, for over four months, and had become accustomed to the warm, oxygen-rich air about one thousand metres above sea level. Then, I accompanied a Basilian seminarian over five days in Bogotá, the world’s third-highest national capital city at 2 600 metres. A picturesque colonial-era district, la Candelaria, is downhill from Casa Annonay, our Community’s house in Bogotá. Therefore, I found the return climb, though only moderately steep, quite strenuous because of the altitude and, relatedly, the colder and drier climate than that of Cali. During a visit to another Basilian house in Medellín, a city spread over three mountain ranges, my experience was similar to that in Bogotá. The ascent on foot to Medellín’s monument of the crucified Christ, El Cristo, had left me both out of breath and amazed at the endurance of the seminarian with whom I had visited that city. In my reflection on my time in Colombia posted in May of this year, I constructed a metaphor between Colombia’s mountainous terrain and our own spiritual lives. St. John of the Cross described a similar concept of spiritual topography in his untitled poem that begins with the phrase, “I went out seeking love.” In the quest to find love, St. John said that we must sink “so low, so low.” In the depths, one encounters the Lord, the experience of whose presence John of the Cross wrote, “I flew so high… that I took the prey.” (2) God, St. John implied, is both Love and lover, and while He is the sought-after prey on high, God is to be found in the lowlands, where He has come to meet us as a servant and as a human being. Fear does not enable Peter, James, and John to interpret the first prediction of the Passion and the Transfiguration completely. Consequently, Jesus’ explanation of the prophecy about Elijah’s second coming is only partly understood as an allusion to the recently-executed John the Baptist. (8) The Passion of Jesus, ahead of the Resurrection, will fulfill that which had been written about both John the Baptist and Elijah. None of the Synoptic Gospel writers mention the disciples’ fear as they descended the mountain, but it is clear that the previous events had clouded their judgement and comprehension of the unfolding circumstances. God had enjoined Peter, James and John to “listen to [Jesus],” His “chosen Son,” (9) but these three most prominent Apostles were incapable of hearing the Word fully, because they were so intensely afraid of Jesus’ eventual suffering and death. Unlike Matthew and Mark, Luke does not place the fear-driven discussion between the Apostles after the Transfiguration, but transposes this story to his post-Resurrection narrative. On the road to Emmaus, the disciples would recall Jesus’ teachings as they realized the presence of the Risen Christ among them: “Were not our hearts burning within us while He spoke to us on the way and opened the Scriptures to us?” (10) Only at that point, with the purpose of Jesus’ journey to Jerusalem accomplished, did the fear of the disciples begin to be transformed by Our Lord into faith and strength, just as death had been changed into life by His Passion and Resurrection. St. Luke also tends, more than the other Gospel authors, to specify the passage of time at important junctures in Jesus’ life. For example, eight days pass between the Nativity and the circumcision and naming of Jesus. (11) Our Lord is twelve years old when He is found in the Temple (12), begins His ministry at “about thirty years of age” (13), and spends forty days in the desert, during which He is tempted by the devil. (14) The Transfiguration, Luke writes, occurs eight days after the first prediction of the Passion. (15) Then, “on the next day,” Peter, James, and John “came down the mountain” and were immersed in the multitudes of people. (16) A single day would have been little time for them to adjust to the tremendous effects of Jesus’ Transfiguration and of His prediction of His Passion. Rendered silent by the simultaneous joy and sadness of these events, the three Apostles must not only descend a physical mountain to be met by a “needy world” (17) that will not allow them to rest, but their negotiation of the mountain, in the spiritual and emotional senses, also requires proper acclimatization. Jesus also underscores the importance of prayer in driving out the demon: “This kind can only come out through prayer.” (37) Similarly, we ought to pray for the dead and for the severely ill. Our Lord’s Passion began with prayer in the Garden. We should follow Him in praying that God’s will be done over our own. (38) Our Father’s will that permitted Jesus to die on the Cross also raised Him from death. Through Christ’s Passion and Resurrection, Satan, the lord of demons, has been cast out, but our path to salvation began especially with the Son of God at prayer in Gethsemane. St. Luke stresses the significance of prayer, too, although in this Gospel Jesus did not directly associate the exorcism of the epileptic with the need to pray, as He did as per St. Mark. Instead, according to Luke only, Jesus was at prayer during the Transfiguration itself. (39) The disciples descended from the mountain into the valley, a place of service in Luke’s Gospel. As such, Luke distinguishes himself from Mark and from Matthew by his heightened level of human concern. Death is a prominent theme in the story of the healing of the epileptic in the Gospel of Luke, as it is in the Matthean and Marcan Gospels. However, as he makes the literary transition between Jesus’ Galilean ministry and His journey to Jerusalem, Luke accentuates the human nature of Our Saviour. As the ideal human being, Jesus is best shown by Luke to be the most empathetic toward humankind. Only Luke identifies, in the words of the epileptic’s father, that the boy is the man’s “only child.” (43) Jesus thus relates especially to the boy whose father pleads with Him from among the crowd of people. Our Lord, hidden by the multitudes, is once again singled out as the only Son of God the Father. In His mercy, Jesus raised the epileptic child and, in a Lucan addition to both Mark and Matthew that again highlights God’s love for humanity, He “returned [the boy] to his father.” (49) Jesus’ act brings to mind His own Resurrection, as well as our own; we also hope, because of the saving mercy of God, to be returned to Our Father in Heaven. The rising of Christ to life, then is the greatest of all miracles and the sum of all God’s great works. (50) Because of His Resurrection we, too, have a chance to be raised from death. We must, though, remain attentive to the instruction of the miracle worker instead of becoming infatuated with the works themselves, as was a temptation of the first disciples and is for every Christian to the present age. For that reason, in the Divine Liturgy of St. John Chrysostom, the priest welcomes the congregation and introduces the epistle reading with the exclamation, “Wisdom! Be attentive!” (51) Jesus prefaced the second prediction of His Passion similarly: “Pay attention to what I am telling you. The Son of Man is to be handed over to men.” (52) The disciples, Luke writes, failed to understand Jesus’ words, and they reacted fearfully. (53) When Jesus had spoken about His Passion and Resurrection for the first time, no explicit mention of fear nor misunderstanding on the part of the Apostles was made by St. Luke. (54) Prior to His entrance into Jerusalem, Jesus would again refer to His upcoming death, but the Twelve would show none of the fear to be expected of them considering the temporal and geographical proximity of the events of which Our Lord would speak. 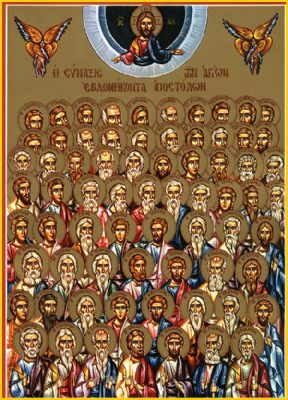 Luke says of the Apostles at the third Passion prediction only that “they understood nothing… and they failed to comprehend what He said,” (55) but their fear is conveyed openly ten chapters earlier. Later on, Jesus took a child from the crowd and placed it among His disciples. Then a foreign exorcist came to John’s attention. This man, John argued, did not belong to those closest to Jesus, although he was able to cast out demons in Christ’s name as were the Twelve. (64) Jesus responded thus to John’s exclusivism, “Do not prevent him, for whoever is not against you is for you.” (65) St. Luke, writing to a Greek-speaking Gentile audience, again shows his inclusiveness in a time when the early Chrisitans were both dying at Roman hands and being excluded from the Jewish synagogues. St. Matthew substitutes the story of the foreign exorcist with that of the payment of the Temple tax (66), but the message is essentially the same: the disciples will come to be considered outcasts. Therefore, anyone who does the work of Christ should be actively welcomed into our community of believers. Following Fred Craddock’s paradigm for interpretation of this section of Luke’s Gospel, the last of four teachings to Jesus’ followers between His Transfiguration and journey to Jerusalem is on Christian sympathy- we ought to regard ourselves as foreigners, in the footsteps of the Redeemer who leads us forth from the manger over high and low lands to Jerusalem and to the Cross. Lord Jesus, You called Your Apostles into the valley from the mountain on which You were transfigured. May we learn Your way of service and accept our physical, emotional, and spiritual low points so that You may raise us to the height that is the Resurrection. Through our work in Your name, may the valleys be exalted and the mountains of our pride be made low. As we celebrate Your birth among us as a human being and await Your coming in glory, grant us, Lord, Your power, understanding, humility, and sympathy as we work for the good of all Your people and promote the growth of Your Church. Amen. God’s blessings to all in this Christmas season and a Happy 2009 to all!